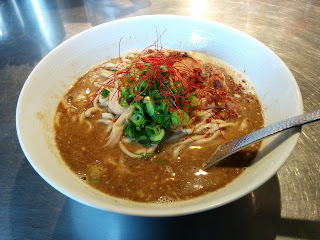 Bassanova will always stand strongly in my mind as one of the early bowls that pushed me along on my quest for ramen. It was one of the great ramen shops I discovered when I moved to Tokyo, and on one rainy day a friend and I ventured out to try it. Living away from Tokyo so long, it has been hard to try it again, but on one of my semi-regular trips I decided I needed to make an effort to stop by. Both this time and last I felt I needed to get Bassanova's specialty: green curry soba. This was no watered-down curry; this was a powerful green curry that could stand on its own. There was just a bit of salt and spice that stood out, coating the medium flat noodles. There were a handful of small, succulent pieces of chashu. Slices of chicken in the soup reminded me of the curry noodle khao soi that I had in my recent trip to Thailand. This is a stellar model of the highs curry ramen can achieve. I remember having this last year and that green curry broth is stellar. Just as good as I remembered.